Do you have an old bike that has been sitting in your garage that you have been anxious to get rid of? Or have a child that is looking for a new bike the next size up? 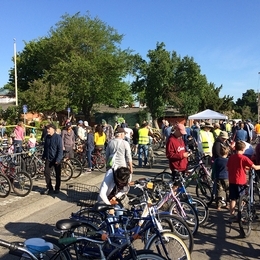 Come to the 7th annual Davis Cesar Chavez Elementary Bike Swap! Deals on used bikes for kids and adults! Cesar Chavez will receive 100% of the proceeds from donated bikes. If you bring in a bike to sell and it gets sold, 75% of the sale price will go to you, and Cesar Chavez will receive 25%. Bike equipment and trailers are welcome as well. Please bring the bikes to the multi-purpose room at Cesar Chavez Elementary School on Saturday, April 6th from 3:00pm-6:00pm or Sunday, April 7th from 7:00am-9:00am. Sign up here https://www.signupgenius.com/go/60b0c45aea82ca57-2019 to help with the intake of donated bikes, bike sales, cashiering, and monitoring the "test track". Folks that know a lot about bikes or know about bike mechanics are also needed to help answer any bike questions for shoppers and also to help tweak donated bikes if needed.